An exhibit of more than eighty works in a variety of media consisting almost entirely of self-portraits – one is hard-pressed to name another contemporary artist so caught up in his own image. And the portraits, spanning nearly four decades, while certainly showing changes of personal style (hair length, beard trim, eyeglasses) and the process of aging, are rather dispassionate, the subject remainingself-protectively closed off, revealing little of the man behind the face. 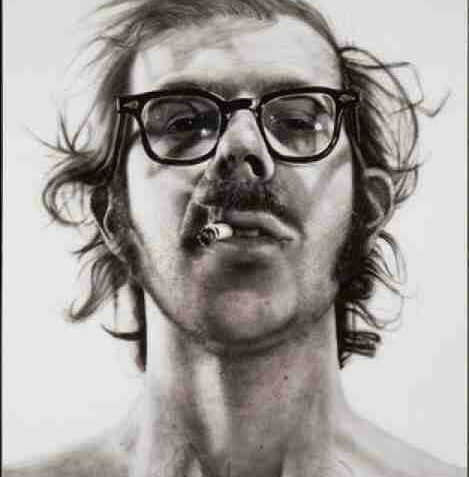 Chuck Close: Self Portraits is an intriguing view into the creative process of the artist, the evolution of the techniques of a master technician who independently found his own way, not unrelated to his contemporaries, but unique among them. It could be postulated that Close could have used still life or landscape and pursued a parallel course to that of his portraits; the focus is process, not subject matter. The first of the paintings, "Big Self-Portrait" (1967-1968), is, indeed, big (nearly nine by seven feet), painted in very thinly spread, black acrylic. The black-and-white product closely reflects the visual texture of the photographs which Close chose to use as the basis for his paintings. Close overlays a photograph with a grid template; the elements of the image/grid are then systematically transposed to another surface (canvas, paper, printing plate) square by square. Sol Lewitt, a contemporary of Close, uses grids in the detailed instructions for the conceptual wall paintings he designs; both achieve a certain exactness through the technique which evokes elements of minimalism and process art, even, for Close at times, photo-realism, the latter morphed, however, beyond the merely representational. As he works with the grid, though, Close doesn’t simply transfer the image; he plays with it, he deconstructs it. Each square of the grid is filled with a stroke of color, an inked fingerprint, an etched line–an enrichment through color and texture that adds an entirely new visual dimension to the work. Seen close up, these portraits break down into their compositional elements, always recognizable but abstracted by the technique, not unlike the pointillism of the post-Impressionists. From a distance, the portrait comes into the more literal photographic focus of the original source. The extraordinary range of materials that Close uses in the portraits (oil, acrylic, ink, graphite, paper pulp, Polaroid prints, and more), as well as a changing palette of color over the years, results in widely varied works within the strictly defined parameters of the gridded photographs. The perspective over four decades is of finely honed craft, of obsessive-compulsive application of technique, and of ever-inquiring explorations and extensions of countless possible permutations and combinations of elements within his delineated mode.